Thanks to its accessibility and relative affordability (versus, say, Tahiti), the Caribbean has become a kind of…predictable choice for a honeymoon. But before you write Belize off as just another island getaway, know two things: 1) It isn’t an island—it’s bordered by Mexico to the north and Guatemala to the south and technically part of the Caribbean and Central America (which doesn’t really matter except know your geography, dude), and 2) there’s no way you’re going to have the same experience in Belize as you would in the more touristy islands nearby, like Turks and Caicos, Barbados, or St. Lucia. Not that we’re knocking them, but we want something different (and less crowded) for you newlywed types. That’s why we put together this handy Getaway Guide for your adventurous honeymoon to Belize. One of the best things about Belize is that a ton of people aren’t traveling here yet. In 2016, 385,583 tourists arrived in Belize; that’s significantly less than the 2,181,684 vacationers who dropped by Jamaica, right to the east. Belize also boasts the lowest population density in Central America, with 35 people per square mile—especially appealing if you and your bride really want some privacy to indulge your post-wedded bliss. The weather is another major plus. While Belize does have a hurricane season, it doesn’t typically get as many direct hits as neighboring islands. And while the wet season lasts from June through December, there’s a break in late July and August called the “little dry” with weather that mimics the dry season (between February and May). No matter when you go, you’ll get an average yearly temperature of 84°F, and consistent humidity around 85 percent—perfect for the beach, but not unbearable. One thing to be aware of in Belize is safety—the U.S. Department of State warns tourists to exercise caution, as violent crime (including sexual assault, armed robbery, and murder) is common and local police lack the resources to respond effectively. So always plan accordingly. But, that shouldn’t stop you from going, but make sure to travel smart and be aware of your surroundings at all times. Belize is also the only English-speaking country in Central America—perfect if you’re not looking to get lost in translation on your honeymoon. But it’s home to a number of ethnic groups that have a distinct influence on the culture. About 35-percent of the population is Kriol, descendants of enslaved Africans and English and Scottish log cutters; 34-percent are Mestizo, or a mix of Maya and European; 10 percent are descendents of the indigenous Maya and fall into three groups: Yucatec, Mopan, and Q’eqchi’ Maya; and about 6-percent are Garifuna, a mix of West African, Central African, Island Carib, European, and Arawak descent. Not only does that make for a rich, diverse cultural experience, but it makes for really good food. No matter where you are, local ethnic groups offer their own flavors and customs, so make sure to seek those out. Where you stay truly depends on what you want to do. The international airport is in Belize City, in the north, but you’ll want to book it right out of the city. Go to the northern islands, like Ambergris Caye, the largest and one of the most well-known islands in the country, where you can visit the Belize Barrier Reef. If that’s too touristy for you, Caye Caulker is a much more laidback option where the main mode of transport is foot or bicycle. Both destinations are home to some of the best scuba diving and snorkeling in the area—especially at Hol Chan Marine Reserve, Mexico Rocks, and Shark Ray Alley—as well as windsurfing, manatee tours, and saltwater fishing. Northern Belize is off the beaten track, but home to Corozal, a quiet haven with close ties to nearby Mexico, and Orange Walk, the country’s fourth largest town, along the banks of the New River. This is a great place to set up camp if you’re interested in exploring the rural side of the country and soaking up the varied cultural influences while visiting some of the major Maya landmarks like Lamanai and Cerros. Down south, you’ll find eco-tourist destinations like Placencia, Hopkins, and Dangriga, which have all the charm of old fisherman’s villages (and less tourists than up north). Road trip down Hummingbird Highway or visit the world’s only jaguar preserve (to celebrate the fact that you won’t need a big cat picture for Tinder anymore!). Kayaking, snorkeling, saltwater fly-fishing, and whale shark watching are also top-notch ways to spend your days here. Head west to San Ignacio Town if you’re looking for more of a jungle experience. 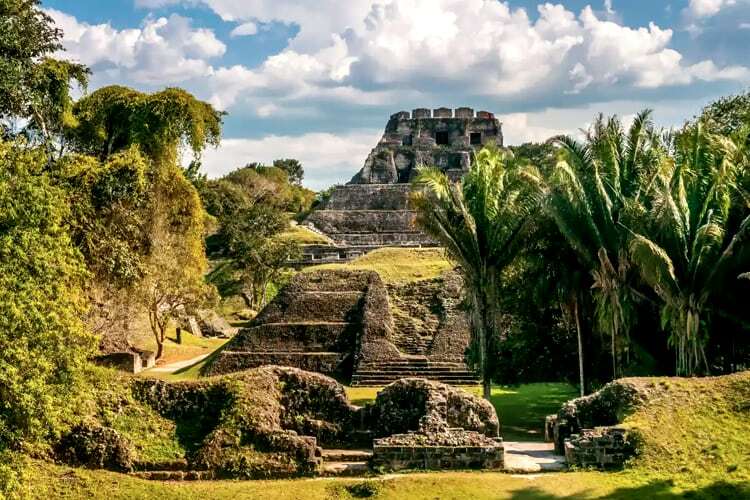 It’s a great home base if you want to go caving in Actun Tunichil Muknal, chasing waterfalls, or exploring ancient Mayan archeological sites like Caracol, Xunantunich, and Cahal Pech. You can also get your nature fill at Noj Ka’ax H’Men Eljio Panti National Park. Learn those pronunciations! Located in San Pedro on Ambergris Caye, Victoria House is a luxury, beachfront property that practically screams honeymoon (without going overboard). The Reef Romance Package includes seven nights, massages for two, a snorkel excursion to Hol Chan Marine Reserve and Shark Ray Alley, daily meals, a private candlelight dinner by the pool or on the beach, and free use of the hotel’s kayaks. It’ll cost you between $3,930 and $4,206 depending on the time of year. Chabil Mar’s 7-night Destination Honeymoon packages to Placencia on the southern coast include the seafront honeymoon suite; roundtrip airfare between Belize City and Placencia; all breakfasts, five lunches, and all dinners; a couple’s massage; a full-day snorkel adventure, Monkey River Howler Monkey Adventure, Cockscomb Jaguar Wildlife Reserve, and Xunantunich Mayan Ruins excursions; a two-day golf cart rental for exploring the village; and complimentary use of bicycles, kayaks, and paddle boards. Rates start at $5,441 per couple. Hamanasi Adventure and Dive Resort is tucked between the Maya Mountains and the Caribbean Sea offers luxurious beachfront suites or private treehouses (!). 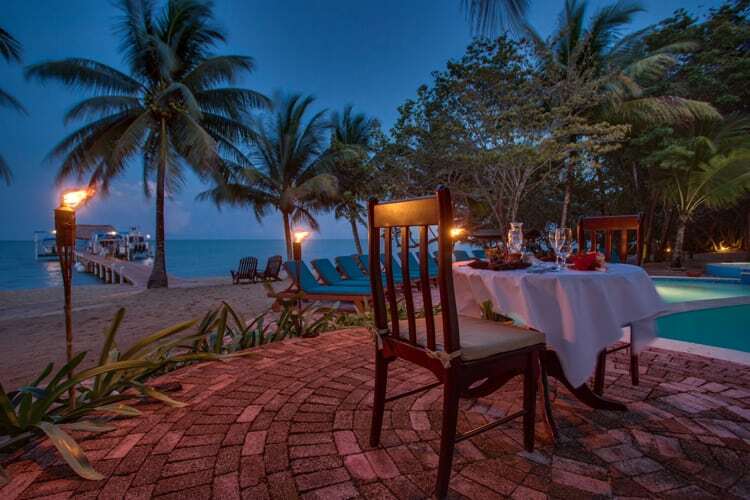 The Honeymoon & Seaside Romance Package includes accommodation, massage for two, a romantic dinner for two, all other meals, round-trip air transfers from Belize City to Dangriga, and your choice of five adventure excursions, like barrier reef diving, jungle hiking, tropical birding, or a night hike through the Jaguar preserve. Your tab will be $2,748 and $3,977 per couple for seven nights, depending on the season. Head to the western jungle for a three-night stay in the gorgeous San Ignacio Resort Hotel on the hillside of the Macal River. The honeymoon packages includes accommodations; air transfers; daily breakfast; two dinners; a romantic dinner on your suite balcony; aromatherapy massages; a full day tour either cave tubing, zip-lining, or to Actun Tunichil Muknal cave; horseback riding to Xunatunich with a picnic lunch; and access to the on-site iguana conservation project and Rainforest Medicine Trail. Three nights start at $2,760 per couple; you can add on after that. Stay on your own private island off of southern Belize at Yok Ha Resort, in a beachfront cabana that overlooks the great Belize Barrier Reef. (It’s like going to Tahiti without the price tag!) The Honeymoon All Inclusive Package includes air transportation to Dangriga, accomodations, all meals, a candlelight dinner on your private veranda every third night, and free use of the resort’s kayaks and snorkel gear. Seven nights costs $3,580 to $4,660 per couple, but you can also shorten or lengthen your stay. Belize isn’t the kind of place you head to if you just want to sit on the beach all day sipping Panti Rippas, arguably the country’s most popular cocktail (it’s coconut rum and pineapple juice)—although you can do that, because there are plenty of beautiful beach bars and bartenders happy to serve them. Just maybe do that between visiting some of Belize’s coolest sites. At 984 feet across and 410 feet deep, The Great Blue Hole is basically, well, a sinkhole. But it’s also part of the Barrier Reef Reserve System—a UNESCO World Heritage Site and is the world’s largest natural formation of its kind. 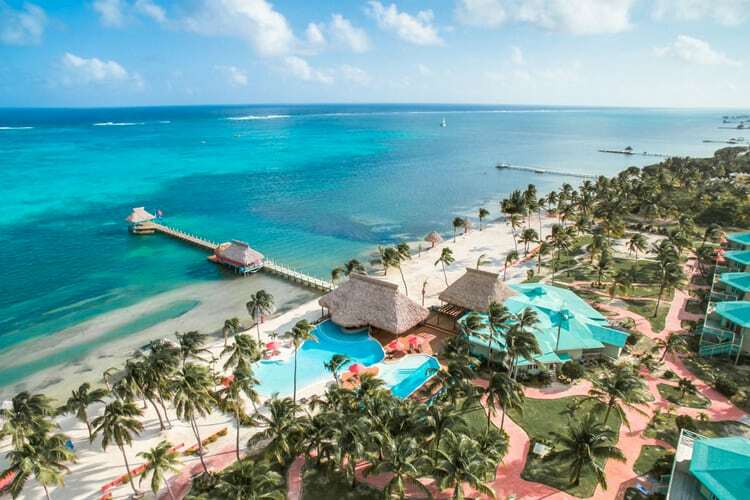 It’s about 62 miles off of Belize City, on the central coast, and it’s a hugely popular destination for recreational scuba divers. At one point, Belize was the center of the Maya world. If you and your new wife are history buffs, head up north to Lamanai, one of the largest Maya ceremonial centers. It was occupied for over two millennia, making it the longest inhabited Maya city. Other Maya highlights include Xunantunich, the second tallest ruin in all of Belize located towards the west; Caracol, which is one of the most challenging Belize ruins to reach (it’s on the western edge of the Maya Mountains) but totally worth it thanks to its 140-foot tall pyramid; and Lubaantun, another ceremonial center on the southern coast. The Chiquibul Cave System is the longest cave system in Central America, stretching underneath parts of western Belize as well as in Guatemala. You can explore Actun Tunichil Muknal, or “Cave of the Stone Sepulchre,” an ancient Mayan underground ceremonial area (it’s home to the “Crystal Maiden,” a calcified skeleton that sparkles in the light—romantic!). Or canoe the 4.5 miles of Barton Creek Cave, float through float what the Mayans called Xibalba—their mythic underworld—a river-carved subterranean cave in the Maya Mountains, or drop into Actun Loch Tunich, “the mother of all caves,” which requires rappelling 300 feet through a black basin into the cave. Just make sure you’ve packed properly. If you’re a beer fan, stop by Riverside Tavern in Belize City before you head back to the airport in Belize City Owned. It’s owned by the family that brews Belize’s local beer, and serves up seriously delicious signature hamburgers. The brightly colored Lazy Lizard Bar & Grill in Caye Caulkner is a must. Indulge in one of their famous frozen drinks while sticking your feet in the sand—the bar is on a channel called the Split, which was created by Hurricane Hattie in the 1960s. Get your fill of home-cooked Caribbean BBQ at Brenda’s in Placencia, where you may actually be served by Brenda herself. Fresh fish, conch, crab, and shrimp are typically on the menu, and save room for her famous hot macaroons. 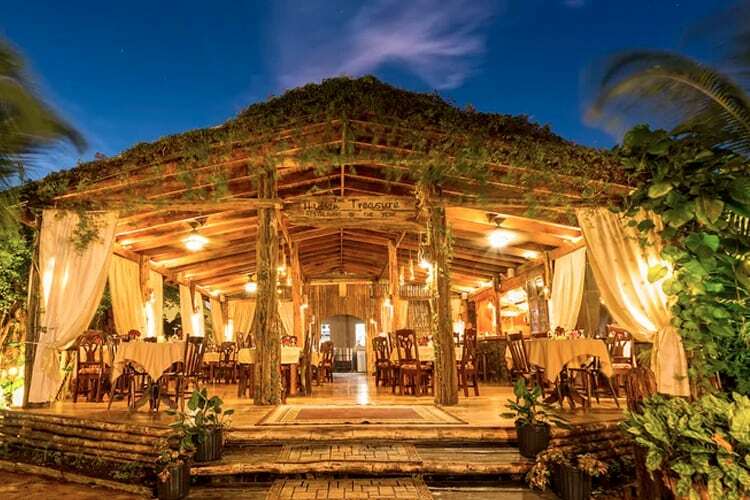 Flee from the tourists in Ambergris Caye for a candlelit meal at Hidden Treasure, a rustic dining room tucked away in a residential neighborhood. The menu is full of locally inspired delicacies like Caribbean Jerk Shrimp, Butterfly Lobster, and ceviche. Nightlife isn’t huge in Belize, but in San Ignacio, you can stop by The Fox Club, a swanky, colonial-style bar with a huge outdoor patio just made for sipping cocktails as the sun goes down.